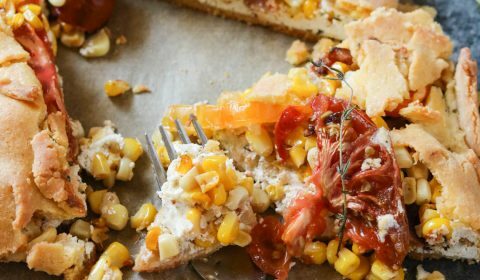 This heirloom tomato and corn savory galette features a sweet cornmeal crust and then brought together with the heirloom tomatoes and fresh sweet corn by a garlic thyme ricotta filling. This galette is a little different from the dessert gluten-free galette recipes, because we’re venturing into the savory galette category with this recipe! And did I also mention there’s bacon, too?! I mean, it doesn’t get much better than this in the savory department. If you would have asked me just a few years ago to eat a dish loaded with tomatoes I would have told you that you were crazy. 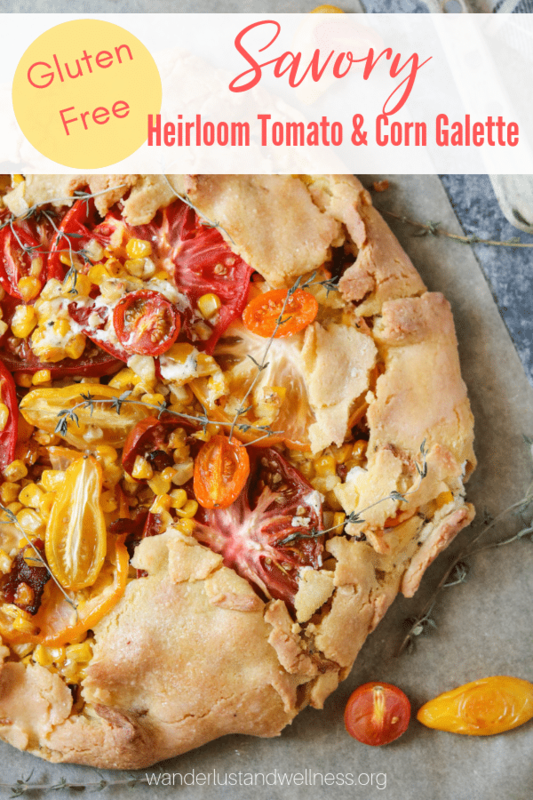 Slowly I’m learning to love tomatoes, so this summer season I’m bringing you several recipes incorporating both tomatoes and sweet corn, like this heirloom tomato and sweet corn savory galette. Have you ever tried a savory galette? They are so good! This savory galette’s crust is a sweet cornmeal crust, which pairs perfectly with the tomatoes and sweet corn inside the galette. As you’re preparing the galette crust, don’t get frazzled if it crumbles and breaks as you assemble it. That’s the joy of a good, rustic galette! As you can see in my pictures, it definitely has its flaws, and that’s totally okay. The key is to let the dough sit in the refrigerator for at least 30 minutes so that it’s easier to manipulate as you assemble the galette. Summer season is winding down, so grab those fresh tomatoes and sweet corn and get to cooking! 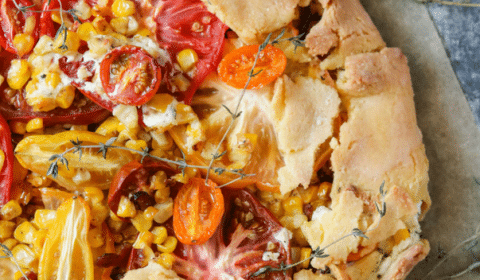 How to make a savory heirloom tomato and corn galette. In a large skillet, cook the bacon until done. Remove and place onto a paper towel-lined plate to drain. Cut the corn from the cobs and add to the bacon grease, cooking for about 15 minutes. Crumble bacon and add back into the pan. Remove from heat and set aside until ready to assemble the galette. Then, in a large mixing bowl, combine the ricotta, garlic, basil, and thyme, stirring to combine. Once the crust is chilled, remove from refrigerator and place onto a floured surface. Using a floured rolling pin, roll out the crust into a large circle, about 12-14 inches. Using a spoon, spread the ricotta filling onto the galette in the center, within about 1 1/2 inches from the edge of the crust. Next, add the corn and bacon mixture and spread over the ricotta. Then, slice the cherry tomatoes in half, and slice the large heirloom tomatoes into thin slices. Begin layering them onto the corn mixture. Begin folding the edge of the crust inward, overlapping the edge of the filling layer. Top with fresh thyme. Using a pastry brush, brush on the whisked egg white to give the crust edges a nice egg wash.
Bake for 45 minutes. Once done, remove from oven and let sit for 5 minutes before serving. Can you freeze cornmeal galette crust? Yes, you can freeze tightly wrapped cornmeal crust for up to 3 weeks. Let thaw at room temperature before rolling out. Cornmeal itself is gluten-free, however, some cornmeal mixes may have additives in them that contain gluten. Be sure to check the packaging of the cornmeal you purchase. Bob’s Red Mill carries a wonderful gluten-free cornmeal that I used in this recipe. Are polenta and cornmeal interchangeable? Cornmeal is an ingredient, where polenta is a dish. For this recipe I would not suggest using polenta. Enjoy these other summer-inspired corn recipes! 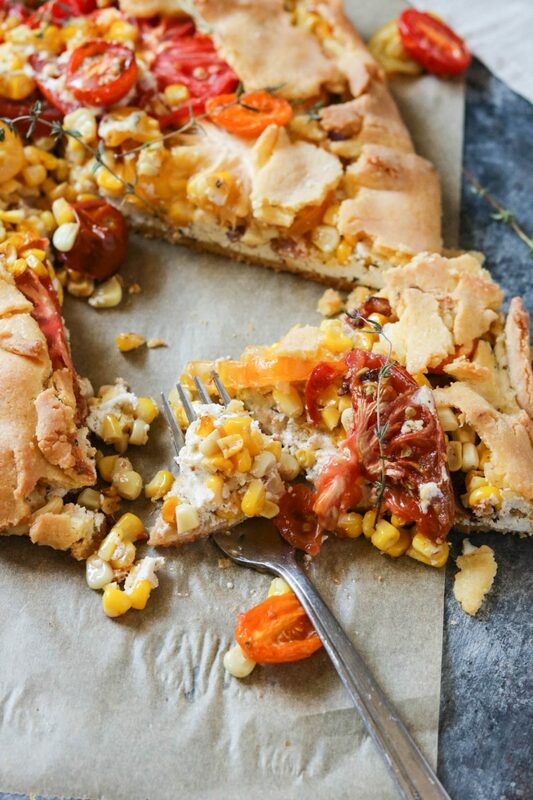 This gluten-free heirloom tomato and corn savory galette is a savory summertime galette with fresh sweet corn and heirloom tomatoes. In a food processor, process the flour, cornmeal, sugar, and salt. Cut the butter into small cubes, add to processor and pulse to combine. Add the egg, pulse to combine. Transfer to a small bowl, form into a ball, wrap in plastic wrap and place in the refrigerator for at least 30 minutes. In a large skillet, cook the bacon until done. Remove and place onto a paper towel-lined plate to drain. Cut the corn from the cobs and add to the bacon grease, cooking for about 15 minutes. Crumble bacon and add back into the pan. Remove from heat and set aside until ready to assemble the galette. In a large mixing bowl, combine the ricotta, garlic, basil, and thyme, stirring to combine. Once the crust is chilled, remove from refrigerator and place onto a floured surface. Using a rolling pin, roll out the crust into a large circle, about 14 inches. Using a spoon, spread the ricotta filling onto the galette in the center, within about 1 1/2 inches from the edge of the crust. Next, add the corn and bacon mixture and spread over the ricotta. Then, slice the cherry tomatoes in half, and slice the large heirloom tomatoes into thin slices. Begin layering them onto the corn mixture. Begin folding the edge of the crust inward, overlapping the edge of the filling layer. Top with fresh thyme. Using a pastry brush, brush on the whisked egg white to give the crust edges a nice egg wash.